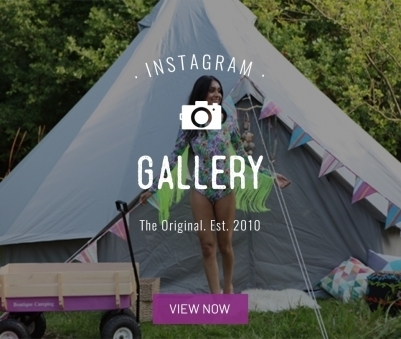 Originality – From the day we started Boutique Camping in 2010 we have aimed to bring a fresh approach to camping, bringing a little colour to your camp (#colourfulcamping). We are always looking for new ideas and new products - so your feedback and ideas are always more than welcome. Quality – We source only the best components we can find to make our products, and would not accept anything less. We also ensure that year on year, we are constantly improving based on our customer comments and feedback. Excellent Customer Service – Whilst we are only a small company, we ensure that our offices are manned 9am-5pm (GMT) Monday to Friday. We have a dedicated Customer service team in order to help you with any query or problem you may have. Years of Development – We are always improving our tents and over the years we have upgraded every part of our Bell tents - from zips to our centre poles, even the actual canvas weave. We are more than happy with the outcome, but we are always looking for the next means of improvement. 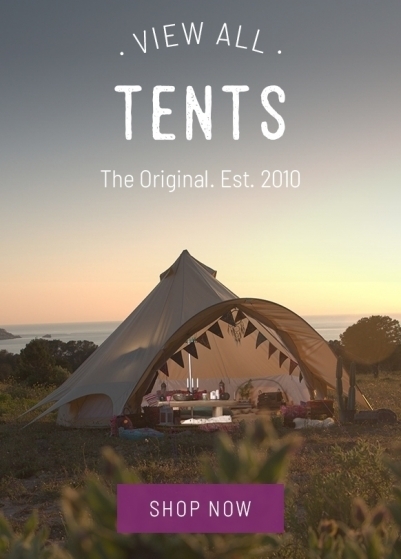 How do our Bell Tents compare to others? All in our upgraded custom Boutique Camping extra strong packaging. We are also the only Bell Tent company to offer Bell Tents in a array of different colours and patterns. Where can I read reviews of Boutique Camping? Reviews of Boutique Camping can be found on Trustpilot. If a product has been reviewed, this will be shown on the product page. If you would like to leave us a review on Trustpilot, we would really appreciate it! 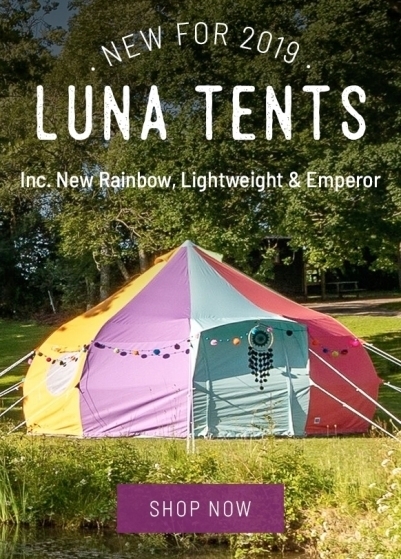 How easy are our bell tents to pitch? Can our Bell Tents be used as permanent structures? Our Bell Tents are designed to be used for leisurely purposes, we don't recommend erecting them as a permanent structure. 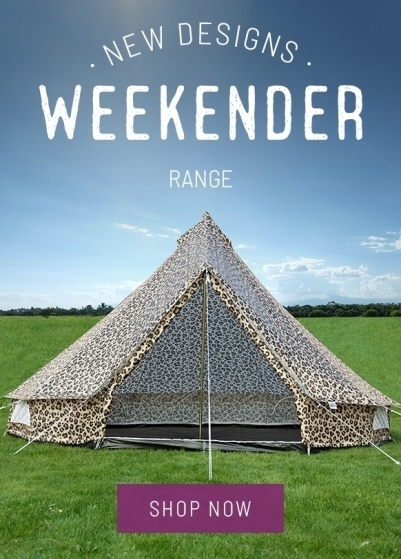 However, many of our customers do use our tents throughout the summer months. Our Bell Tents have enough waterproofing agent on them which will cause the water on the surface to ‘bead’ after a downpour. You will literally see beads of water forming on the outer surface of the canvas. When it is time to re-waterproof, you will notice that the water no longer beads, and that the Bell Tent retains the moisture in the canvas for longer. Bell Tents are not designed for extreme weather conditions as all the weight and tension is taken by one centre point, the centre pole. We have made this super strong, however you will need to make sure the guy ropes are equally tensioned, and the centre pole is straight to insure your tent is as strong as it can be. The wind direction should also be taken into consideration. Try to pitch with the back of your tent facing the wind. This will help to conduct the wind over the Bell Tent rather than up against it. An uneven pitch will place uneven tension on the canvas, poles and other components, as will an overly exposed pitch. The canvas and the groundsheet must be dry before storing your Bell Tent. Never keep your Bell Tent stored away wet or damp for longer than two days otherwise fungus can affect the canvas which will create little black irremovable dots. The canvas has been impregnated with anti-fungal treatments, but this will not be effective if your tent is not stored dry. There are many canvas cleaning companies out there, however this can be expensive. We also have many cleaning and reproofing agents we sell. The best way to remove mud is to let it completely dry and then use a stiff brush. It's very simple but very effective. We offer tents in three different materials: polycotton, Oxford canvas and polyester. Each of these materials have their advantages - you can find out more from our Fabrics page. We don’t try to squeeze as may people in our tents as possible, but we would recommend the following: our 3m and 4m tents are great for a couple or up to 4 adults, 5m is also great for a couple if you would like to use a proper bed, however you can comfortably fit up to 6 adults. The 6m is good for groups up to 8 adults, the 7m tents are great multipurpose tents, and we have also recently introduced our enormous 8m bell tent! We have slept 10 adults in these, but also 25-30 people all sat down relaxing. Which of our tents are suitable for a fitted stove? Our polycotton tents are suitable for use with our fitted stoves. We would not recommend fitted stoves being used in our Oxford canvas or polyester tents. Why choose a multi-door option? Ease of airing your tent without having to roll the sides up. Delivery to any mainland UK address is next day if the order is placed before 1pm, and delivery to the rest of Europe is 3-5 days. Deliveries further afield are also very quick, especially considering the size of our tents! If you have any enquiries regarding shipping times, please do contact us. We can ship your Bell Tent anywhere in the world. If your shipping Zone is not covered in our delivery page, please email us your destination country and zip code and we will provide you with a quote. Can I pick my tent up? Due to occupational health & safety (OHS) regulations at our warehouses we are unable to facilitate pickups of our tents. All orders must be delivered using our extensive courier network. Freight costs include full insurance - if you did encounter any shipping issues, our customer service team would be more than happy to investigate and sort this for you. Unfortunately, we are an e-business (online only) and do not have a showroom for products to be viewed. We do offer a 7-day money back guarantee if for any reason you wished to return your tent. Does someone need to be home to accept your delivery? We strongly recommend someone being available to accept delivery as we use a secure courier who requires a signature as proof of receipt. For your convenience, we recommend having your order sent to your work address if being at home during business hours is not an option. 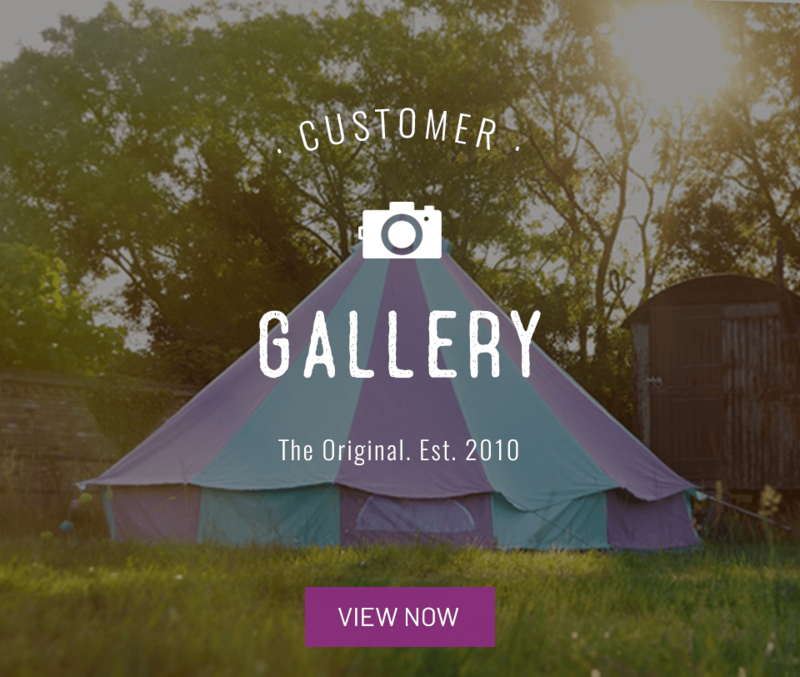 All of our Bell Tents come with a 12-month warranty against manufacturing defects. We do not cover damage that is not the result of a manufacturing defect. Wear and tear is not covered. If there is a problem with you tent or product you have bought from us please send us a photograph with a description and your order details. Our highly committed after-sales department is available to help you with any queries after your purchase, and will resolve the matter as quickly as possible for you. We accept a number of different payment methods including most credit/debit cards (including American Express), PayPal, Amazon Pay, Apple Pay, BACS and V12(our finance provider). We are also able to take order over the phone or provide proforma invoices for orders. 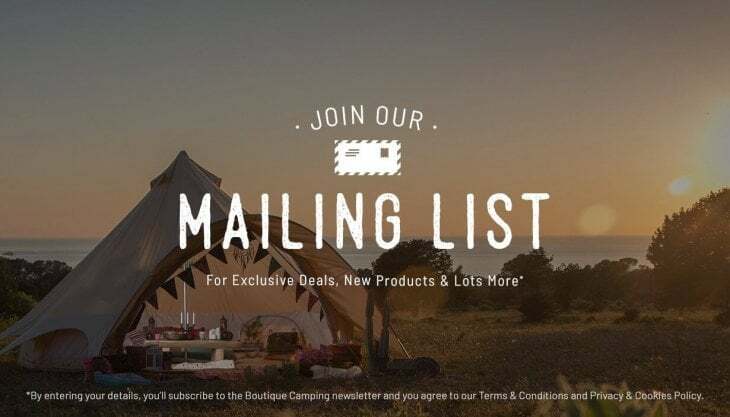 Boutique Camping Supplies Limited, VAT No: GB 122 020195, Company No: 07401199.